LALA GROUP OF INDIA - has for 55 years been involved in almost every aspect of the organic herbal supply chain, from agricultural production through to international commodity trading and the creation of branded products. We are one of India's leading Essential Oils Suppliers, Wholesale Essential Oils Suppliers and Pure Essential Oil Exporter. Building on this experience, we have developed an innovative approach to source and supply one of the world's largest range of Organic Plant ingredients. Our commitment is to deliver a smooth, transparent and managed supply chain from primary production to end-use, assuring quality and traceability. LALA JAGDISH PRASAD & CO."INDIA" draws on more than 100 producers and suppliers in 40 countries covering over 1,000,000 hectares of certified land, specializing in the provision of Pure Essential Oils, Essential Oil Absolutes, Plant-based Raw Materials & Ingredients to international manufacturers and traders of food, beverages, medicines and cosmetics. We operate to the most stringent criteria and standards of sustainable agriculture and environmental management and are committed to benefit-sharing. The core of our activity is creating partnerships with farmers and collectors of plants, assisting them in meeting the market parameters for a crop and handling its sale. Uniquely, LALA GROUP has developed a profit share structure whereby producers are offered a financial stake in the company based on a share of annual profits. Although we hold stocks of some key ingredients in the INDIA, most products are shipped direct from source to customer. Through efficient supply chain management, we are able to ensure fair prices for producers whilst at the same time remaining competitive. LALA GROUP "INDIA" principal objective is to develop partnerships with producers and collectors of organic herbal ingredients and sell their products into the international food, cosmetics and medicines markets. We achieve this by quality control, efficient management of the supply chain, a keen understanding of the buyer's requirements and providing an exemplary service. Operating to the highest ethical and environmental standards, we actively support organic farming, the managed collection of wild plants, biodiversity and rural livelihoods. Business can, and should, be used to promote sustainable development, environmental conservation and socio-economic progress. Given the global nature of economic activity, Organic Partners is founded on the premise that to actualize the philosophy of sustainability, it must have a sound and coherent business strategy. Built on a 25 year foundation of successful entrepreneurial activity within the herbal sector, Organic Partners has the means to 'walk the talk' - to deliver services to both producers and buyers of herbal ingredients efficiently and cost effectively. Through sound business management, we deliver the non-financial aspirations which are at the company's heart. Environmental sustainability without consideration of the social dynamic cannot be truly sustainable. Communities which are exploited are inherently unstable. LALA GROUP INDIA believes that benefit sharing is not only ethically right but that it is also a foundation stone of sustainable business. LALA JAGDISH PRASAD & CO. policy espouses fair trade and benefit sharing - and makes this concrete by independent verification standards. We are certified as a Fairtrade company by FLO (Fairtrade Labelling Organisation) and incorporate the criteria of FairWild, Soil Association's Ethical Trade Programme, and the UEBT (Union of Ethical BioTrade). LALA JAGDISH PRASAD & CO."INDIA" ensures that our quality systems and those of our suppliers meet all the criteria required by today's market. Quality starts with the living plant. We have been working with farmers and collectors for many years and are constantly extending our relationships with new producers and into new product areas. In addition to farm visits, we use a comprehensive assessment system through which we establish the capabilities of all new suppliers. This acts not only as a vetting procedure but also provides the basis for the critical path that a producer must follow to achieve the required standards. 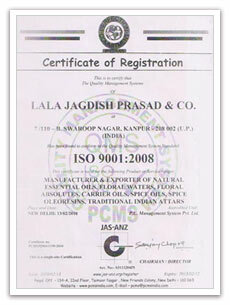 LALA JAGDISH PRASAD & CO."INDIA" maintains full product traceability throughout import, processing and export. Working closely with producers, incorporating certifying bodies procedures and utilizing unique batch codes, we are able to guarantee batch integrity through every step of the supply chain. Our warehouse and processing facilities operate a comprehensive HACCP Policy. All samples undergo physical analysis by our quality team. Organoleptic assessment meetings are held to check samples of every batch - type, pre-shipment and as delivered - for both liquid and dry products; testing for the latter includes colour, taste, texture, aroma, foreign matter and cut. All samples received are stored for three years, providing an extensive reference. We apply rigorous quality checks and documentation controls to each batch delivered and have the flexibility to provide most analysis or specifications that a customer may require. All culinary or infusion products are sold with microbiological analysis which we arrange before shipment as are Aflatoxin and Ochratoxin analysis which are provided to INDAS/ISO 190222 standards.